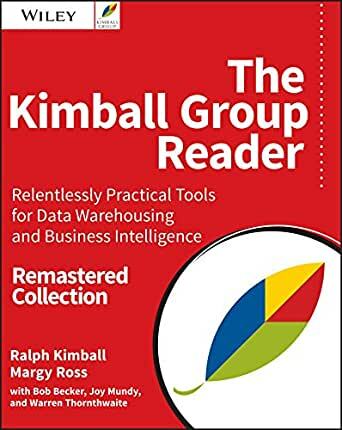 The Kimball Group Reader, Remastered Collection is the essential reference for data warehouse and business intelligence design, packed with best practices, design tips, and valuable insight from industry pioneer Ralph Kimball and the Kimball Group. This Remastered Collection represents decades of expert advice and mentoring in data warehousing and business intelligence, and is the final work to be published by the Kimball Group. Organized for quick navigation and easy reference, this book contains nearly 20 years of experience on more than 300 topics, all fully up-to-date and expanded with 65 new articles. The discussion covers the complete data warehouse/business intelligence lifecycle, including project planning, requirements gathering, system architecture, dimensional modeling, ETL, and business intelligence analytics, with each group of articles prefaced by original commentaries explaining their role in the overall Kimball Group methodology. Data warehousing/business intelligence industry's current multi-billion dollar value is due in no small part to the contributions of Ralph Kimball and the Kimball Group. Their publications are the standards on which the industry is built, and nearly all data warehouse hardware and software vendors have adopted their methods in one form or another. This book is a compendium of Kimball Group expertise, and an essential reference for anyone in the field. Ralph Kimball and the Kimball Group have continued to refine their methods and techniques based on thousands of hours of consulting and training. This Remastered Collection of The Kimball Group Reader represents their final body of knowledge, and is nothing less than a vital reference for anyone involved in the field. Recognized and respected throughout the world as the most influential leaders in the data warehousing and business intelligence (DW/BI) industry, Ralph Kimball, Margy Ross and the Kimball Group set the industry standard withThe Kimball Group Reader. Now in its second edition, this preeminent text has been updated with 65 newDesign Tips and white papers to create a remarkable collection that spans more than two decades at the forefront of DW/BI innovation. This easily referenced and newly updated collection is invaluable if you're involved with data warehousing or business intelligence in any capacity. Wiley Computer Publishing Timely. Practical. Reliable. 5.0 out of 5 starsBuilding a Data Warehouse? Ignore the lessons in this book at your peril! The last word from the world experts in Dimensional Modeling. For over three decades these people helped hundreds of organizations pull data from multiple transactional systems into a centralized analytical platform. This book summarizes the wisdom gained from that experience. It ends with some speculation about where the world of Data Warehouses may go next. While there is a lot of technical content in this book, by far the most important information in my opinion is about organizational issues: at all costs one must resist the temptation to start coding too soon. Before coding, all stakeholders need to reach agreement on how every fact and dimension table will be defined. Different departments will have their own definitions of similar fields in their databases, and these must be harmonized. The owner of each data source and the owners of the data warehouse need to agree on who does which part of the ETL process, how, and on what schedule. And so forth. One chapter lists 38 specific questions that absolutely need to be answered before building a data warehouse; in the authors' experience skipping any of these questions ALWAYS costs more in the long run than answering that question at the outset. It's articles so does have a little repetitive topics but overall good book. It's not a hard read, but if you are not familiar with the concepts, I can see where you can get lost. 5.0 out of 5 starsVery good overview! I've enjoyed reading the Kimball Group's design tips on their site for years. As a wonderful parting shot before retiring the group, all those nuggets have been collected and conformed into this wonderful anthology. The last chapter is particularly rewarding to read, as it consists of one final article from each of the four surviving members. They don't disappoint! 5.0 out of 5 starsThey are always amazing. It's a Kimball book. They are always amazing.